Hey, bookies! 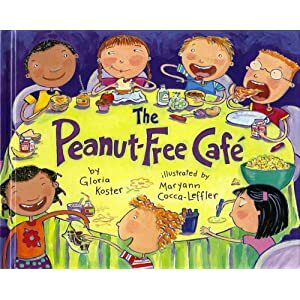 I just read The Peanut-Free Cafe by Gloria Koster. It’s a story about a new student at the Nutley School, where everyone enjoys PB&J at lunch, forcing the peanut-allergic new kid to eat by himself at a peanut-free table. In an effort get to know him, the school offers an irresistible peanut-free cafe for anyone willing to give up their peanut butter. The story is clever and the idea of a creating a peanut-free cafe at our house greatly excited my son (as if my house isn’t ALWAYS a peanut-free cafe, but who’s counting…). However, I would have liked it better if the story focused more on Grant, the child with the peanut-allergy, and his feelings rather than the kids who are able to eat regularly. Kids with food allergies are looking to see parts of themselves reflected in the media and literature. And, while my son appeared ready to connect with the Grant, his relationship with the character and plot faded rather quickly as it more prominently focused on a child without food allergies. That said, I think this is a great book to have in school libraries. It should teach students a bit about what kids with food allergies go through and inspire compassion. The librarian at my son’s school already ordered a copy earlier this year and the book is constantly checked out. My younger son (4), who has no food allergies himself, had a playdate with his adorable friend. While running from one room to the next, they found time to stop just long enough to eat some leftover Valentine’s Day Pez – a fact I didn’t know until the next day. Although the food (and candy) in our house is always nut free and almost always dairy and egg free… And, although this friend has no food allergies, it is still important that he learn to ask an adult before sharing. This lesson has been long-ingrained in my older, food allergic son, but I think it will be important for me to re-state this principle with a new angle. While we’ve been so focused on keeping my big guy safe from his many food allergies, we may not have emphasized enough the need to think of other kids and theirs. Thankfully, it was Pez (sugar, unpronouncables, and dye but no top allergens) and no harm done. But, we’ll be talking before our next playdate. 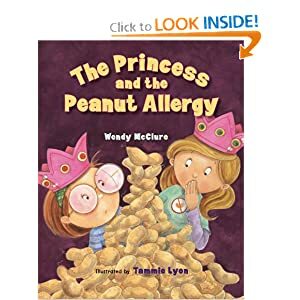 We just read, The Princess and the Peanut Allergy by Wendy McClure (see the book’s listing on Amazon). The story centers around two best friends, Paula and Regina. Regina has an upcoming birthday party planned to the last detail including a nut-laden cake and peanut butter candy. Paula is allergic to peanuts, which causes some problems for Regina. The girls have an argument that is ultimately resolved when Regina realizes that having her nut-filled cake may compromise her friendship with Paula. And, Regina surprises her friend by ordering her birthday cake nut-free. This is an interesting book because it’s told from the perspective of a child who does NOT have food allergies. The princess and pea analogy used to enlighten Regina works as a way of explaining that even the smallest bit of peanut could be extremely harmful to someone who is allergic to them. Importantly, the book addresses some of the social issues that can arise from having a food allergy and helps articulate conflict resolution in an age-appropriate way. I had been concerned my son might not relate to the content of this book given that a) he’s a boy and b) he has multiple food allergies, not just peanuts. But, I watched as I read Paula’s part of the dialogue. My son was nodding and pointing to himself, relating to her situation and dilemma. In fact, once we finished, he said, “You know, sometimes it’s hard having a food allergy. It’s can be so disappointing when you can’t eat something that looks yummy. And it feels unfair when everyone else can have it.” His emotional awareness made me proud, although it makes me sad he even has to deal with food allergies in the first place. We plan on using this book to read to my son’s elementary school class this week. I’ll report on the results of our talk later this week!